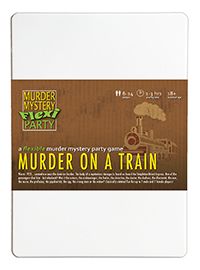 You've been invited to play the role of Miss Crimson in Murder on a Train. In the coldest month of 1933, somewhere near the Austrian border, passengers aboard the Simpleton-Orient Express experience a murder that will change their lives forever! But who killed mysterious stranger John Doe? Join us to find out whodunit! As a spy, your job is to be beautiful and alluring so foreign dignitaries tell you all their secrets, and your long red satin gown means you are very good at your job. Dark curls tumble over your shoulders and long gloves caress your arms. As a child, you had a penchant for dressing up in your parents’ clothes, hiding in closets and secretly recording conversations. Which was problematic for your parents, who ran a closet-making firm in a swanky part of town. Your efforts were rewarded, however, when you recorded the mayor on a date with a beauty pageant winner who was not his wife, and a future spy was born. The name’s Crimson, Miss Crimson. I’m very sorry about the murder of John Doe but I’m afraid I can’t help with your enquiries. I work for the British government, highly classified, can’t say any more or I’ll have to kill you. I also collect china dogs - I have over four hundred and I’m traveling to an auction in Turkey to acquire some more. I’ve got an art deco dalmation in my sights and I always catch my prey. I was in the dining car at the time of the murder.